I have spent most of my years wondering what Hogwarts house I would belong in. And when I say that, I mean I’ve spent way too many hours obsessively tapping my fingers in introspection. For about half of those many years I have been told time and time again that I am unquestionably, undoubtably a Ravenclaw. So when Pottermore launched, part of me was just itching to go and check, but something stopped me. I did not go to Pottermore, in fact I waited approximately seven years before I visited. I now know that I was terrified, as dorky and riddikulus as it sounds, yes I was terrified. What if I ended up in a house I didn’t feel like I was part of? Part of me had always held onto this idea that I, like the trio, was part of Gryffindor, but I knew that I was probably Ravenclaw. I have spent years avoiding my inevitable sorting, but I finally caved. I’m not sure how I feel now that I have. I took every other quiz I could before this one, including an Ilvermorny house quiz, which I was surprised to find I am not a Horned Serpent, I am a Wampus, known to be the body of a wizard and the warrior. So maybe that should’ve been my first warning flag. When I finally took the sorting quiz, I came out Slytherin. I understand to a degree, but I wanted a second opinion. So I did something taboo, I cheated the system, which, thinking about it now, may make me more Slytherin than I thought. But still, I made another account. It never hurts to get a second opinion. This time Ilvermorny was not a Horned Serpent, instead a Thunderbird, known for spirit and adventure. Both for Ilvermorny and Hogwarts I tried to answer very similarly to the first sorting and as true to myself as I felt I could be. For Hogwarts, this time I came out Gryffindor. I should be ecstatic, the secret hope has been partially confirmed. But something still doesn’t sit right. I feel the most closely linked to Ravenclaw and the Horned Serpent, the houses of the wise, studious, and intellectuals. How could my results say traits, that yes, I do have and pride myself on, outweigh what I believe to actually be my strongest characteristics? I have spent so many years of my life wondering about this… to the point where I am just straight up confused now. Understandably, the houses together form one complete concept – everybody has a bit of every house. The point of the sorting is to identify the strongest of those traits, so why do I feel that the traits identified by a J.K. Rowling-approved computer algorithm as my strongest are wrong? Maybe because that’s just it. Despite my unerring geekiness and absolute worshipping of J.K. Rowling, I am not going to trust a computer to tell me what house I’m supposed to be for Ilvermorny or Hogwarts. The decision is for the Sorting Hat and the Carvings alone to make, and it is widely recognized that the Sorting Hat takes your belief into consideration and it is a personal belief that the carvings of Ilvermorny do too. I, to give Pottermore some credit, as I stated before have an unerring belief in almost anything J.K. Rowling approves. That being said, I believe that this was partially correct both times and partially wrong both times. The readers are what bring the story to life, and believe me, I am a reader and Harry Potter is definitely very much real life to me. So shouldn’t what I believe to be true mean something? I feel that I have the ambition, resourcefulness, and many other characteristics of a Slytherin, but I also feel that I have the boldness, daring, and countless other traits of a Gryffindor, and equal to both of the previous I feel that I have the curiosity, drive for wisdom, and basically everything else that Ravenclaw treasures. My feelings on the Ilvermorny houses mirror my feelings on the Hogwarts houses – I value adventure, strength, and wisdom. 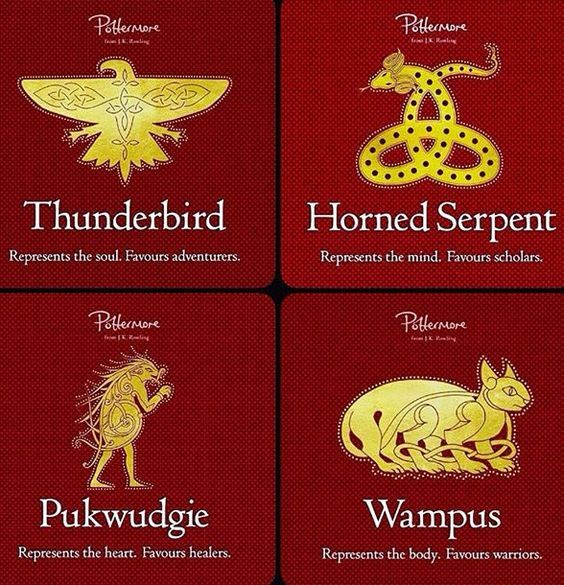 Simply put, I will continue to stand by my allegiance to all: Ravenclaw, Slytherin, Gryffindor, Wampus, Thunderbird, and Horned Serpent. But those of the steadfast Pottermore belief will have to forgive me for my terrible sin: I am going to take Pottermore as suggestion. I will continue to believe that I am a Ravenclaw/Horned Serpent who has very strong tendencies toward the many other houses, like the well-rounded person, with an inclination toward intellect, I believe myself to be. Why Can’t Boys Have Long Hair?